This is our new blog. We hope you enjoy it! This post will give you a brief outline of the key scaffolding regulations in the UK. Well, strictly speaking, there are no direct scaffolding regulations; but there are many laws which do affect the trade. If you would like to find out more than please read more. Let us begin. People who work in the UK are likely to know, or hear about the main UK health and safety law; the Health and Safety at Work Act (HSWA) 1974. The Act sets out the main principles of UK health and safety law. And also, it allows for the making of other health and safety law too. Plus, it grants power to those who need to enforce the law. In a way, you could say that the HSWA is scaffolding regulations; but why is this? Well, it is simple. 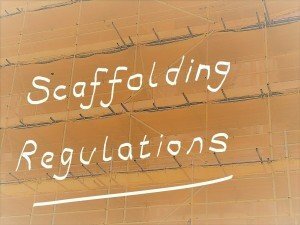 Scaffold employers will need to comply as others do, with any legal duty that the Act does impose on them. The Management of Health and Safety at Work Regulations (MHSWR) 1999, is also key law here in the UK. And this is because the MHSWR work in a way to support the HSWA. The MHSWR give rise to a well-known employer’s duty in the modern workplace. They set a formal need for employers to assess risk; and to control risk too. And the basis of how to apply risk control. So, although there are no direct scaffolding regulations there are still many laws, which do affect the trade. And there are a two laws which have a big impact; one, is the Work at Height Regulations (WAHR), 2005, and the second is, the Construction (Design and Management) Regulations (CDMR) 2010; The main laws that relate to construction work. Like the MHSWR, the WAHR set out a heirarchy on how to control risk. The term, so far, as it is reasonably practicable, qualifies each level. I will keep it basic. The first aim, of course, is to avoid work at height. A scaffold firm can do this, but usually it is not likely. So, when scaffolders need to work at height, the next step is to prevent falls. And then, the next level is to the reduce the effect of any fall. In the past, it seems there was too much bad practice in peoples’ work at height. This cost lives. In response, the scaffolding trade body, the National Access and Scaffolding Confederation (NASC), set up work at height guide, SG4. People in the scaffolding trade now see SG4 as best practice. It focuses on scaffolders setting up a ‘safe zome’, from which to work. And also on working at height equipment and its safe use. A scaffold firm who complies to SG4 is likely to be working in accord with the WAHR. Lets move on to the CDMR. In construction work, the CDMR create roles for the people that it will involve. This includes the clients. And, there are roles too for those who will design, act as a contractor, or work on the job. It is not often that a scaffold firm will act as a principal contractor, on site; as they are usually responsible to another contractor. But broadly speaking, the CDMR ensure that every contractor has a duty to protect their workers health and safety. JHS could mention other scaffolding regulatons which are relevant, however, to discuss these will be getting in far too deep for this article. For an informal chat, please get in touch. Well, I hope you have found this article interesting and useful. We can help with all your scaffolding health and safety needs – we also help building contractors too. Have you had your equipment stolen, and what do you do to prevent theft at work? What are your views on CPD courses being included as part of the CISRS card renewal process, starting from Summer 2017?